Please see ALL of these sweet little details and let me know what you think with a comment! I don't usually have SUCH a collection of items... but when I was challenged to use a Scrapbooking layout to inspire a card.. 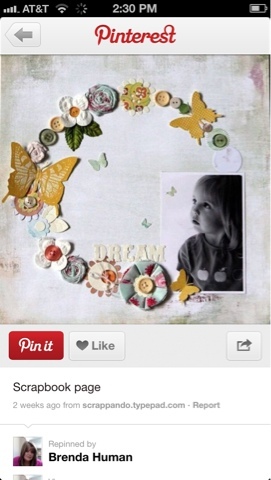 I took my birthday pedi and perused Pinterest to see some fun inspiration. 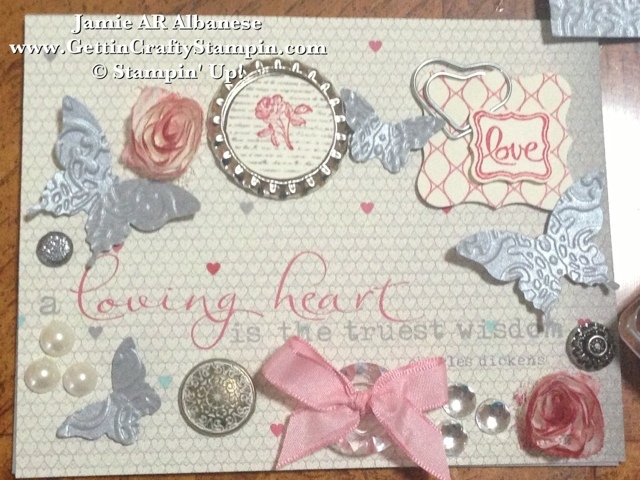 HERE is a beautiful layout that I transferred into this sweet card! 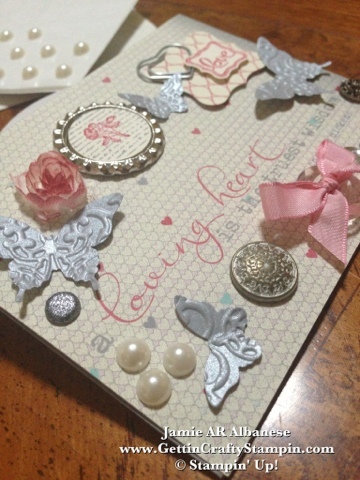 Isn't it fun but challenging to create this card from this layout? I used MANY elements to create this WOW card! 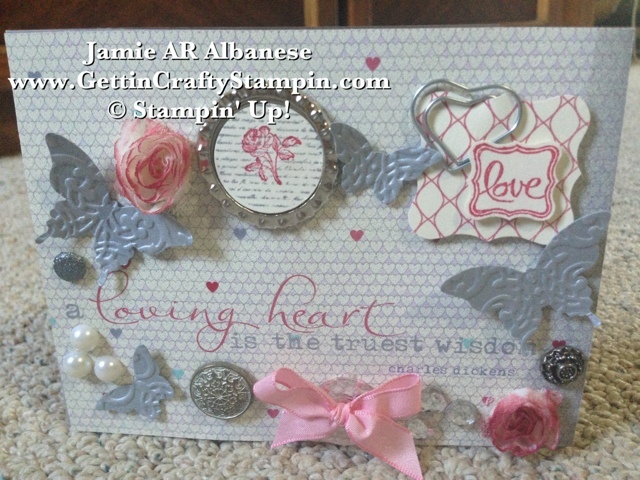 I started with our More Amore Designer Series Paper with this beautiful 'a Loving Heart is the truest wisdom'. Framing it with our Brushed Silver cardstock that was run through the Lacy Brocade Textured Impressions Embossing Folder (Spring Mini) and Big Shot. Using my Elegant Butterfly (Idea Book & Catalog) and my Bitty Butterfly (Spring Mini) Punches to pop out these textured butterflies. With my Ciao, Baby! 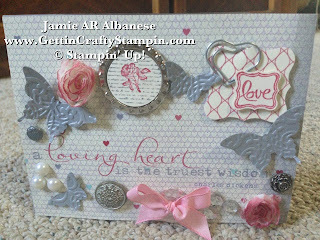 stamp set (Spring Mini) I captured this LOVE sentiment that perfectly coordinates with the Petite Curly Label Punch (Sale~A~Bration) and layering this perfectly punched dash of love with another sheet of our More Amore Designer Series Paper in the Curly Label Punch (Idea Book & Catalog). 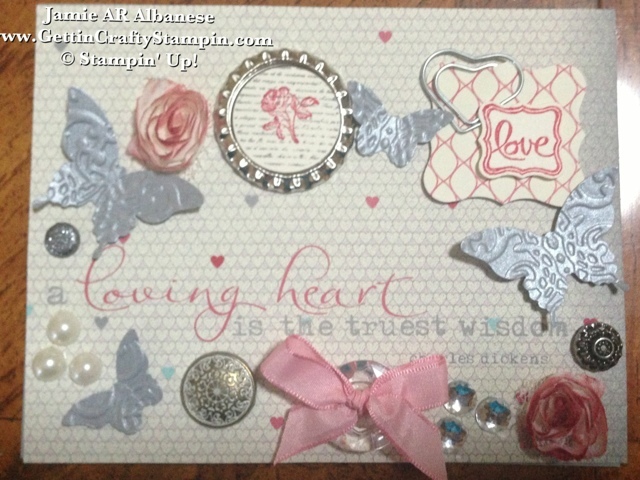 Adding this Paper Clip Heart from our Cute Clips Elements collection (Spring Mini) is a fun dash of more love. 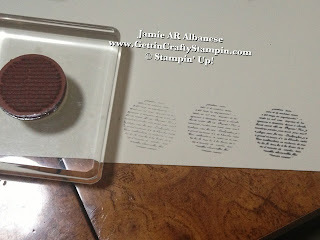 Stamping OFF - this technique is a great way to get the look you may be seeking! Simply Stamp Once and see the Darkest image, Continue to Stamp... and each image will get lighter! Here with Basic Grey ink this Collage Curios scripted circle once stamped twice became the lighter look that I liked. 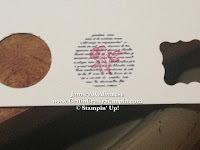 With our BEAUTIFUL Vintage Dimensional Flower Trim rubbed into the Real Red stamp pad. 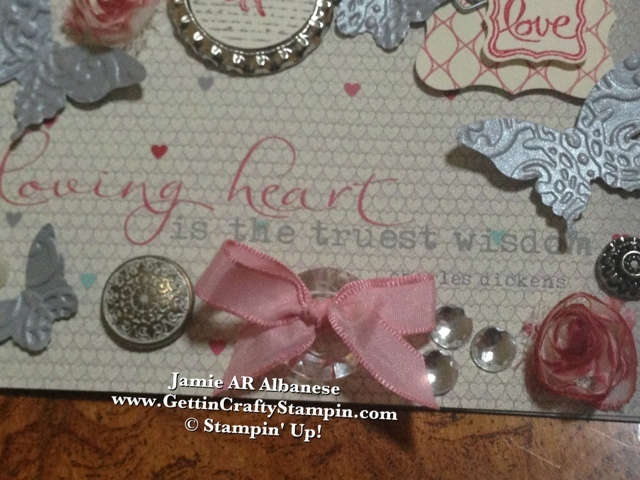 These two tone roses now resemble my beloved Double Delight Roses... sigh... and fit perfectly in this card! 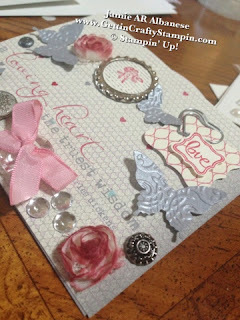 With our Glimmer Brads and Antique Brads add fun vintage elements to this card and are an easy way to embellish! Tie this sweet card up with our Vintage Faceted Designer Series Buttons and our 3/8" Pretty In Pink Taffeta Ribbon (Idea Book & Catalog) is a sweet way to wrap it up! 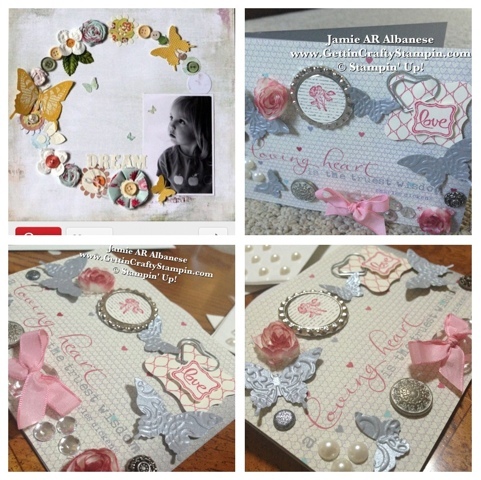 When you pull all of these elements together, it's a different but awesome, multi element project inspired by a stunning scrapbook page! This More Amore Designer Series Paper even has an aged/colored edge in Basic Grey. 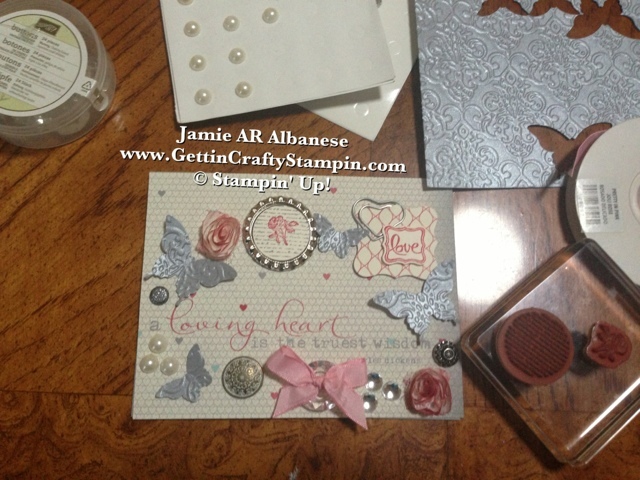 Layering this over the Basic Grey card stock is easy peasy! WHO would YOU give this card too and why?!?! you may get this card sent to YOU to use!! What ELEMENT is YOUR Favorite?!? See ALL of our Amazing Accessories, ribbons, embellishments, jewels, brads, buttons... to our stamps, coordinating tools and more! CLICK HERE* to see ALL of these Products and MORE. 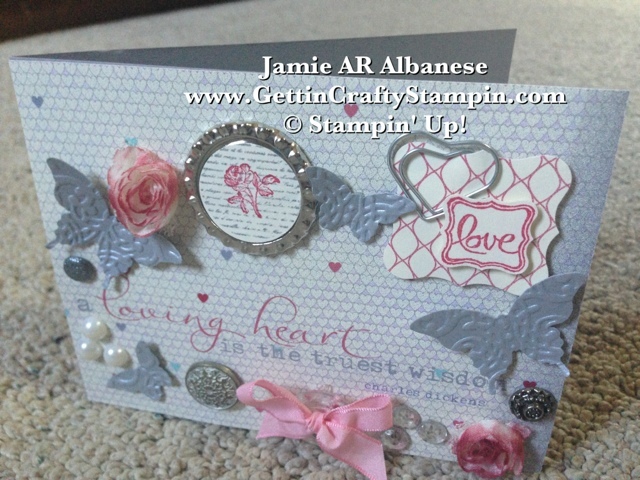 *Remember, too, to save 10% when you select me (Jamie Albanese) on any on-line orders! !